Straight from this year’s New York Comic Con and as part of the 75th Anniversary celebration, Marvel has announced their big comic book crossover plans for 2015, and it involves members of Earth’s Mightiest Heroes in all forms in an event that may very well change everything in the Marvel Universe as we know it to be. The teaser poster seen above, as illustrated by the great and talented Alex Ross, features members of the Avengers from the past, present, and perhaps future battling it out against one another. The classic incarnations of Captain America, Thor, and Iron Man for example duke it out with Sam Wilson/ Falcon Captain America, Female Thor, and the Superior Iron Man, as well as an appearance by Miles Morales, the new Ultimate Spider-Man. Not present though are members of the X-Men, Fantastic Four, or even the original Spider-Man in Peter Parker himself, so one has to wonder what direction Marvel is going, and if this is strictly an Avengers-centered event only. 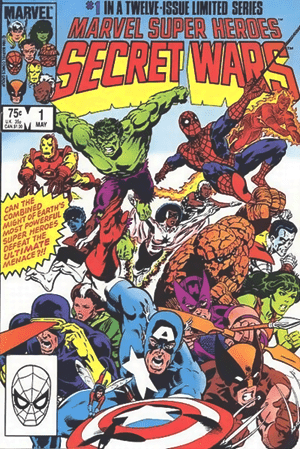 If the title “Secret Wars” sounds familiar, that’s because it’s a nod to the 1980’s crossover classic Secret Wars – which featured both heroes and villains teaming up and fighting against one another in a place called “Battleworld”, as orchestrated by a being known as “The Beyonder“. Running for 12 issues, the series was written by Jim Shooter, and illustrated by Mike Zeck and Bob Layton, and was prominent for enacting some big changes into the Marvel Universe. Some of these include Spider-Man getting his Black “Symbiote” Costume during the event, as well as The Thing choosing to remain on Battleworld and She-Hulk taking his place in the Fantastic Four temporarily. The limited comic series also tied in with a toyline of the same name by Mattel, further expanding the marketing reach and popularity of the event back in the day. 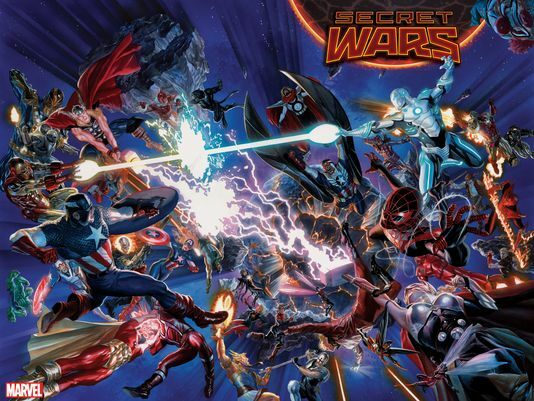 Marvel Super Heroes: Secret Wars is primed to be released in May 2015 – the same month Avengers: Age of Ultron hits theaters for the Marvel Cinematic Universe. Previous articleDragon Age: Origins is Free!! !